Kerry Donahue is the director of the audio program. She’s a former executive producer at New York Public Radio and one of the founding producers of “The Takeaway With John Hockenberry.” In late 2015, Kerry co-produced with Samuel G. Freedman, “Dying Words: The AIDS Reporting of Jeffrey Schmalz and How It Transformed The New York Times,” which featured a book and an hour-long radio documentary distributed by PRX and broadcast on nearly 150 public radio stations around the United States. 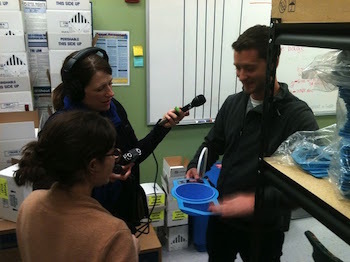 In 2015, she produced several episodes of the PRX Transistor podcast, working with biologist Christina Agapakis as host. Kerry frequently consults with organizations developing podcasts or as program doctor to existing programs. Her work has also been on Marketplace, NPR and WBGO in Newark. Kerry came to Columbia as a student, class of ’99, after several years working as a social worker in Maine. She started teaching at Columbia as an adjunct instructor in 2003. Over the years, she has developed strong relationships within public radio and podcasting, often speaking on panels and training. Kerry fell in love with radio while a student at Oberlin College. She loves the intimacy of radio, the way audio adds texture to stories, and the way good radio writing and sound takes a listener to a location. She grew up in southern Maine, where she still visits regularly and loves. She lives in lower Manhattan with her husband, Guy Story, and their two young daughters, who are forced to listen to so many podcasts they have developed strong opinions about their favorite shows and hosts. One of my favorite teaching moments is when a student who has not considered working in radio suddenly “gets it” and falls in love with this way of telling stories using sound, voices, and descriptive writing.